Learn more about our latest truffle research project. 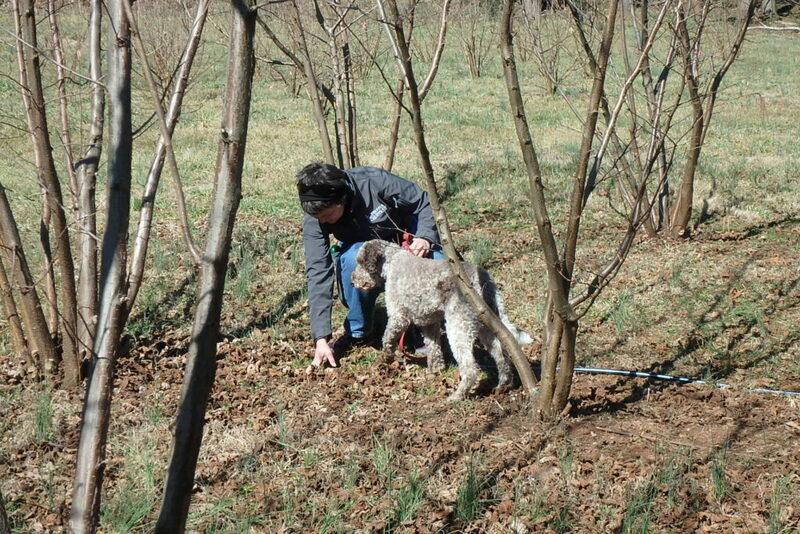 Truffle hunting dog and her handler. 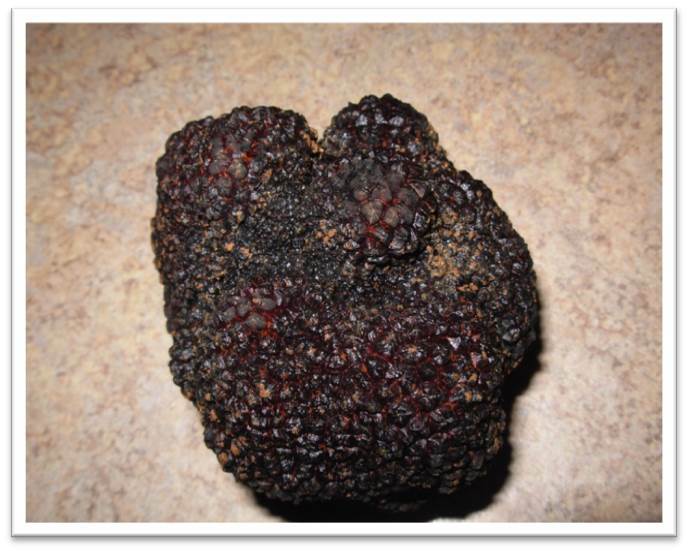 Truffles (Tuber melanosporum) are a highly prized, edible fungus that grows in association with the roots of several species of trees. They are not native to the United States and we are still learning about their life cycle and how to grow them. In North Carolina, filberts are often used as the host tree, although more oaks are now being planted. Roots of the tree seedlings are inoculated with the fungus and the young trees are planted in an orchard. Truffles need a temperate environment where freezing temperatures occur but not where the ground freezes solid. The soil must have a pH of about 7.9 to 8.1 for truffle fruiting to occur. Because soils in North Carolina are naturally acidic, they must be heavily limed to slowly raise the pH. A good site for a truffle orchard should also be well drained and irrigated. Once the trees are planted, the orchards are maintained with light cultivation several times per year. An organic mulch is helpful to keep down weeds, retain soil moisture, and moderate soil temperatures. The first truffles should appear between the fourth to nineth year after planting. They are usually about six inches deep in the soil and dogs can be trained to find them during the winter and early spring. At this time we do not know if truffles can be a profitable crop in North Carolina. Some growers in North Carolina and Tennessee have successfully produced truffles, but many of those orchards have been decimated by the Eastern Filbert Blight. 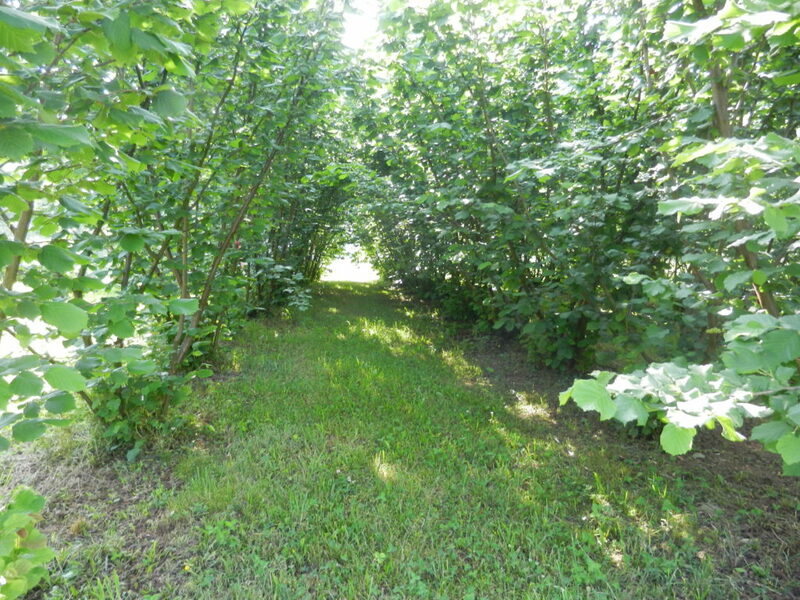 Newer orchards have been planted with trees that are more tolerant of the blight and they are also being closely monitored and pruned and sprayed when the blight occurs. Most of those orchards are not producing truffles yet. Filbert truffle orchard at the Mountain Research Station. Because truffle orchards take so long to produce, and because the truffles occur underground where it is difficult to monitor what is happening, when orchards don’t produce after five years or so, growers wonder if they will ever produce or not. Should they keep maintaining the orchard or give up? There has not been a good way to tell what is happening underground. That is the reason for the truffle grant project (2015-2017) that we recently completed. Visit that page to learn more about monitoring the truffle fungus in your orchard. There are several other kinds of truffles that can be grown and might be easier to produce than black Périgord truffles. They are not as valuable, however. They include, for example, the native pecan truffle (Tuber lyonii) and the burgundy or summer truffle (Tuber aestivum). 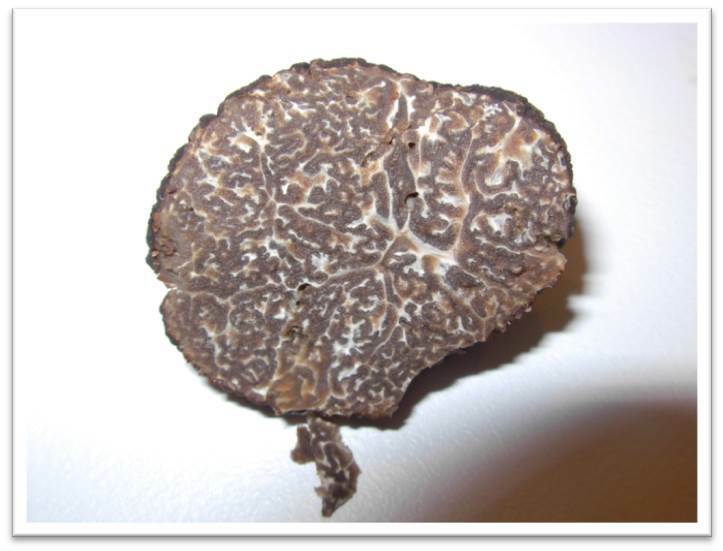 Here are some links that might be helpful to you in your search for information on growing black Périgord truffles, nurseries, and testing services. Most of these are commercial links for companies we have worked with over the years. There are many others and those listed are just ones I know and does not mean I endorse them over any others. Interior of black truffle. Photo credit: Franklin Garland.